At Frankfurter Kreuz arriving from motorway A3 (direction Köln/Wiesbaden) or A5 (direction Basel/Karlsruhe) turn onto B43 direction Airport Frankfurt. continue towards the Terminal 2 (arrival/departure) and car park P3. 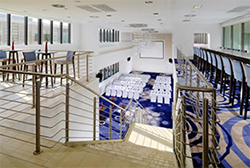 Direct and easy access from the main-line station “Frankfurt Flughafen” (AIRail Center) via “The Squaire”. Direct access from regional train station “Frankfurt Flughafen” underneath the hotel. Direct pedestrian-friendly access via Terminal 1A/B via the covered foot bridge. In public parking areas P1, P2, P3 and P4 at Frankfurt International Airport. 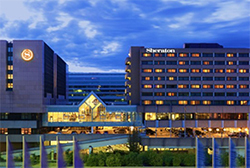 30 parking spaces available at Sheraton Frankfurt Airport Hotel.